Product prices and availability are accurate as of 2019-04-15 19:31:53 EDT and are subject to change. Any price and availability information displayed on http://www.amazon.com/ at the time of purchase will apply to the purchase of this product. 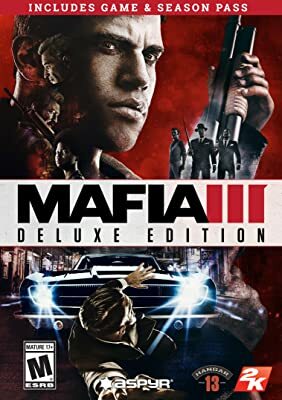 The Mafia III Deluxe Edition includes the full game and Season Pass at a discounted price. The Season Pass grants access to three major expansions over the course of a year, each introducing unique new criminal story lines, characters and gameplay features to the world of New Bordeaux. Plus, get access to exclusive expansion-themed vehicles, weapons and more within each release. 1968. New Bordeaux. After years of combat in Vietnam, Lincoln Clay knows this truth: family isn’t who you’re born with, it’s who you die for. When his surrogate family, the black mob, is betrayed and wiped out by the Italian Mafia, Lincoln builds a new family on the ashes of the old and blazes a path of military-grade revenge and redemption through the Mafioso responsible. authentication; software installations required include the Steam Client. Internet Connection and acceptance of Steam™ Subscriber Agreement required for activation.